Benefit Show: Punk Out Snack Drive with Local Natives – Ouch That Hertz! (October 18th, 2016) – Los Angeles, CA indie-rockers (and one of our personal favorites) Local Natives have teamed up with the non-profit organization Punk Out for a benefit food drive at their tour stop in Philadelphia, PA. All collected nonperishable snacks will be donated to the Attic Youth Center of Philadelphia- an irreplacable center for LGBTQ+ youths. Additionally, your snack donation will enter you in a raffle to win a vast array of prizes, including tickets, signed merch, vinyl, or a poster! 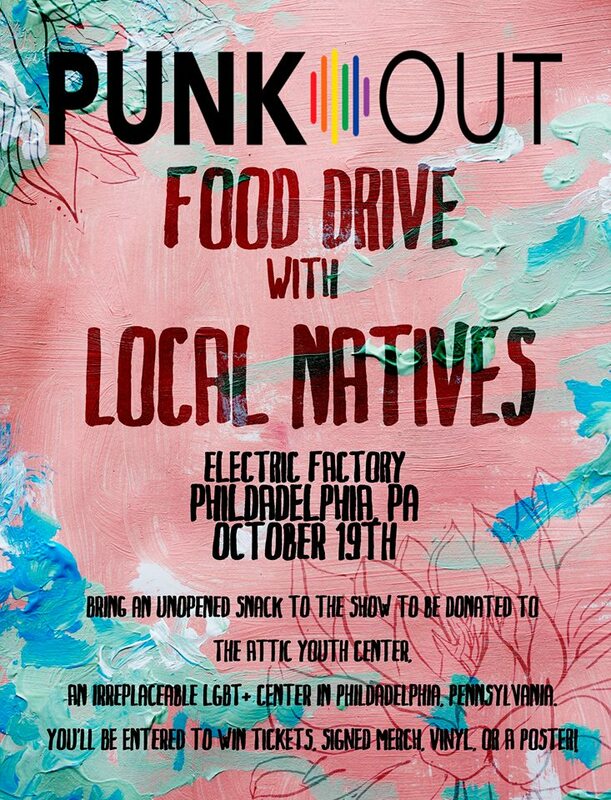 We’re so excited to be teaming up with Local Natives and the great folks at Plus One to throw a Snack Drive benefiting Philly’s own, The Attic Youth Center. Bring an unopened snack to Local Natives’ show on Wednesday at the Electric Factory and you’ll be entered into a raffle to win a bunch of awesome signed merch from the band. We really hope to see you on Wednesday and thank you for your continued support as our music community fights #LGBT+ youth homelessness. The Attic Youth Center is Philly’s only LGBT+ youth resource center. Since 1993, The Attic Youth has served over 10,000 kids. And with over 60 kids visiting the center every day, there are a lot of mouths to feed. Bring snacks to Local Natives’ headlining show at the Electric Factory tomorrow to be donated to The Attic Youth Center and possibly win some signed merch! Let’s demonstrate the power of music to do good! Suggested snack ideas: granola bars, small bags of pretzels, etc. 3. Encouraging closeted musicians and fans to come out, when practical and safe, and to providing the resources and support necessary to do so. 4. Leveraging the influence and power of the alternative music scene to raise awareness of, and put an end to, LGBTQ+ youth homelessness. Over 40% of all homeless youth in the United States identify as LGBTQ+ and are on their own, typically because they have been kicked out of their family’s home. LGBT+ homeless shelters take in these kids and young adults, provide hot meals, resources (such as computers and internet access so these folks can do their school work, apply for jobs, etc. ), and healthcare opportunities. But these shelters need our help! Boom. You did it. You helped better a fellow human being’s day and contributed to the alternative scene’s awareness of LGBTQ+ homelessness. If you would like to contribute further aid to homeless LGBTQ+ kids and young adults in the US, we strongly encourage you visit Punk Out’s site at http://www.punkout.org/! We believe that musicians harbor the power to impact large-scale social change. Our vision is to leverage that power to create a support network for teenagers and adults who identify as lesbian, gay, bisexual, transgender, queer, questioning, transsexual, intersex, asexual, ally, and/or pansexual. Musicians are often cast as idols and role models and if they feel comfortable and confident in being who they are, that comfort and confidence can be life-changing, life-affirming, and life-saving for LGBTQ+ teenagers and adults who are struggling to find themselves. In the United States, LGBTQ+ youth are twice as likely to say they have been physically assaulted, kicked, or shoved at school, and are more than twice as likely to have attempted suicide than our heterosexual peers. LGBTQ+ youth homelessness has exploded in recent years. Some studies suggest that roughly 40% of all homeless youth identify somewhere under the queer umbrella, despite LGBTQ+ people accounting for 8-10% of the general population. All too often, silence seems the only possible mode of survival. This is not a queer issue; this is a societal issue. We believe music can impact large-scale social change. But to create that change, musicians need to feel comfortable to declare their gender and/or sexual identity. Our vision is to have a musical community that encourages individuals to be who they are without feeling distress or fear. We encourage closeted musicians to come out and to be visible, but only when it is practical and safe to do so. Although there are amazing organizations that aid alternative musicians and their fans, there has not yet been a focused effort to directly address the needs of musicians and fans who identify as LGBTQ+. Punk Out is here to make that effort, to be louder than those who throw negative messages at 92% of LGBTQ teens and young adults. However, just like many LGBTQ+ youth and adults, many musicians lack the support network needed to endure the “coming-out” process themselves. In the United States, 4 in 10 LGBTQ+ youth say the community in which they live is not accepting of LGBTQ+ people. We believe access to LGBTQ+ resources is important, but building relationships with fellow individuals who identify as gay, bisexual, transgender, questioning, or queer, along with our straight allies, is even more vital. We want LGBTQ+ musicians and fans to make noise. We encourage those who are silent to use their voices and to feel comfortable screaming and singing about what is at their core. We aim to provide networking opportunities and resources to those who have no support network available to them. Punk Out serves as the map to support and resources. We want to be the hand that helps. We want to create a movement of acceptance in the alternative music scene. We work to start conversations, make LGBTQ+ community members and their issues more visible, remove the taboo within the alternative music community, and increase overall acceptance of everyone. We want to make a positive difference in the lives of gay, bisexual, transgender, questioning, or queer youths and adults, and our straight allies, through the music that drives us. We are Punk Out.